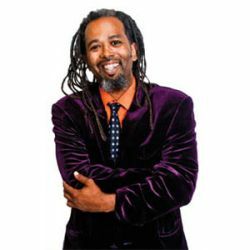 Starting out as a juggler in San Francisco, and now a well-known traveling entertainer, Ngaio Bealum uses his great storytelling ability, his razor sharp wit and engaging stage presence leave audiences howling with laughter. He has earned him a 5 star rating on Ticketmaster.com and he has appeared on ABC, MTV, BET, Comedy Central, and many other television programs. He has opened for Dave Chappelle and Weird Al, and is also a regular guest on The Doug Benson Podcasts. Ngaio is constantly on the road, and has headlined comedy clubs and performed at music and arts festivals all over the country.